Modern day Dubai is an extraordinary place. Clusters of glass skyscrapers pierce the hot, smoggy air, their presence a testament to the alchemy of oil money and limitless ambition. 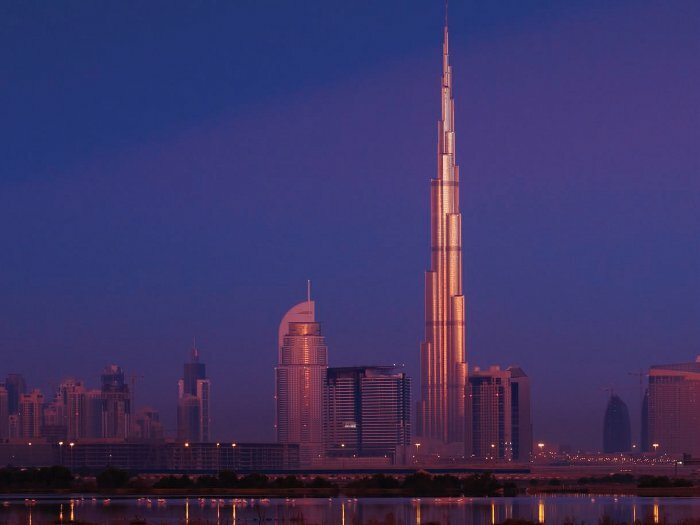 Here 900 skyscrapers have been built since 1991, many of them designed by multinational architecture firms with seemingly no desire (or no client requirement) to create anything appropriate to this region or its climate, and few of them - bar SOM's Burj Khalifa - of any uplifting civic quality. It's a city for the car, its workers leaving their air-conditioned high-rise apartments only to slide into their air-conditioned cars and drive to their airconditioned offices to make money, or to an air-conditioned mall to spend it. Two things strike you quite forcibly after just a few hours here: one is the sickening cost to the planet of sustaining all this air-conditioned comfort in a desert - even without throwing in an artificial ski slope or two just for fun; the other, you are struck by the impoverished quality of life that results from a car-centric city with next to no real public space. There are, obviously, mosques for worship, for those of the relevant religious persuasion. But the only other public, free-to-access, gathering spaces for Dubai's multinational population of workers appear to be the shopping malls. There's plenty to choose from, but all of them much the same: endless corridors of polished marble, with replications of all the same multinational brands you see in every mall in Europe, from the retail divinities like Chanel and Prada to the quotidian suppliers of essentials like Boots and Debenhams. There is no street life, according to one of the many long-term expat residents I met on a trip there in December. Nobody wanders along the street to find neighbourhood cafes or street-stalls (apart, that is, from the multitudes of low-paid construction workers). The only restaurants and bars its more well-heeled residents visit are all within the artificial environments of shopping malls and hotels. The same resident asserted that there is also no sense of community. Having spent 20 years making a comfortable living there, she confessed that she has no idea who her neighbours are, and feels no connection to the city other than as a place to live and work. She certainly doesn't call it home. Why not? Well, the Dubai government's policy never to give its hard-working incomers citizenship plays a part. But could it also be the lack of any genuine public space that is the cause of this dystopia? Public space is something we are very concerned about in the West. New York is reclaiming its roads, adding separate cycle lanes to its multiple-lane highways, paving its previously grid-locked squares and transforming them into pedestrian boulevards, bristling with pavement cafes and lounges. London is also enjoying an unprecedented boom in new public space, as developers are obliged by planning law to provide 'environmental enhancements' in the form of additional gathering, seating, entertainment and strolling space for all. 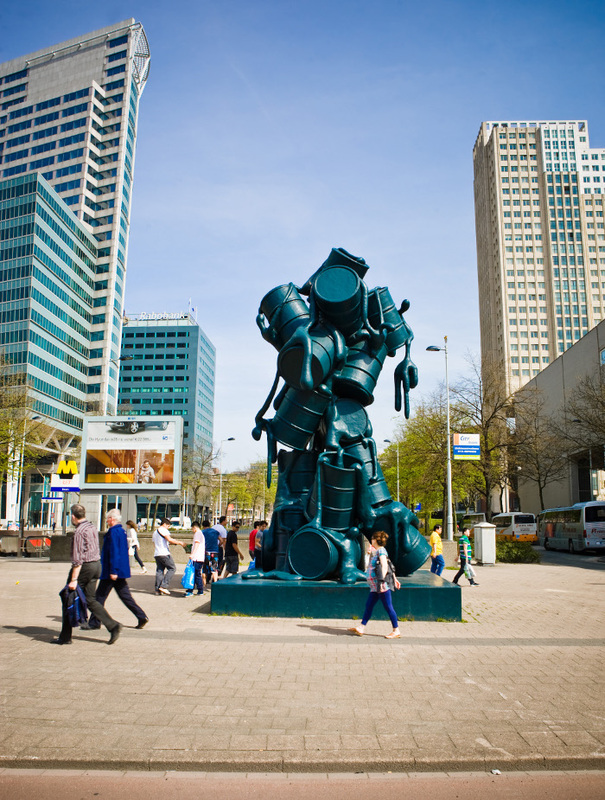 It was slightly strange, therefore, to visit Rotterdam - a city that seems to have thrown out the planning rule book in its rush to reinvent itself after being flattened in the Second World War, and to do so very much along American, carcentric lines. Here, I found that public space, of the grand, generous, civic kind we've come to expect of our continental cousins, was pretty absent. Like Dubai, the overwhelming motivation for construction in Rotterdam appears to have been commerce and traffic control, not civic placemaking. There are hundreds of skyscrapers here. Like Dubai, they are of very variable quality. There is, thankfully, street life - in particular two attractive historic streets filled with interesting indigenous boutiques, bars and cafes, alongside bigname multinationals - and culture in abundance, with several world-class galleries and museums. But the one or two public piazzas and squares I encountered seemed deserted and lifeless, filled with weird and unattractive (to my eye, at least) public art. However, when you dive down even the most unprepossessing street, you can find evidence of thriving and vocal citizenship. For example, behind the spectacular new central station are bland blocks of unexceptional office buildings, made far more interesting by the graffiti that adorns them, leading to a huge motorway that carves the city in two. Straddling this motorway is a simple wooden footbridge. With its floor painted a vivid yellow, it was crowdsourced from the community to connect the two neighbourhoods flanking the highway. Each of the 17,000 planks lining this bridge bears either the name of its donor or their message. The footbridge initiative was masterminded by architecture practice Zones Urbaines Sensibles, as a way of bypassing the normal systems of real-estate development and improving the urban realm faster than would have been possible under the city's 30-yearmasterplan. 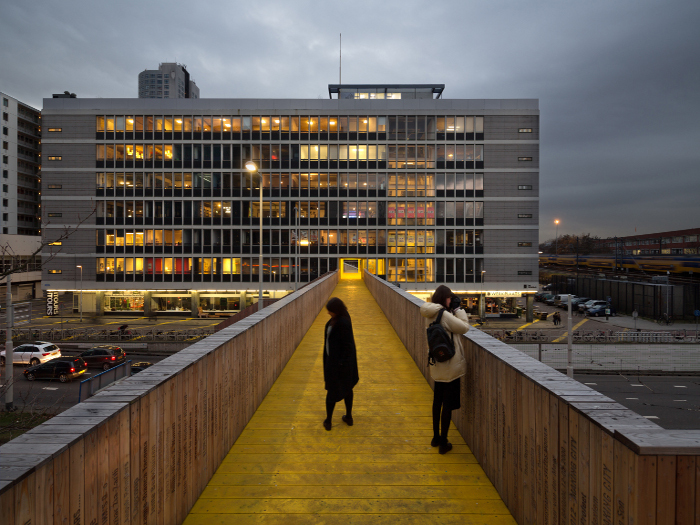 In Rotterdam, public space is being seized and newly created by an articulate, engaged population that is used to having a voice and wants to make up its own mind about what matters: footbridges rather than fountains. Maybe we should look beyond statues, fountains and benches to see evidence of a real connection between a neighbourhood and its residents. But a city without even these? That's clearly no place you can call home.